A few years ago I joined Facebook to write about privacy issues with their Beacon advertising system. I was quickly sucked in by the fun, convenience and easy ability to keep in touch with family and friends. I really enjoy the ability to share photos and even love to see vacation photos and cute babies from people I don’t really know in real life. While I am continuing to use Facebook, it may not be for everyone. One of the aspects of Facebook I’ve never advocated are “applications”. While I appreciate the thought, don’t be hurt if I don’t accept your hugs, glitz, jewels, pets, drinks or farm animals. While this may be fun for millions it’s not why I use Facebook. What most people don’t realize is that “Applications” aren’t part of Facebook. They’re created by 3rd party companies. When you agree to downloads an application, you share your info with a company which may have a completely different security and privacy terms as Facebook. Everyone should keep in mind you don’t have to accept every request on Facebook. Of course, I’m against Domestic Violence, Child Abuse and Cancer but I also won’t join a cause on Facebook which has access to my personal info. It’s ok to click on Ignore. Here’s an example of your options on who you want having access to your personal info. Some time ago I created a “Fans of WinPatrol” page and promoted it as a way to share WinPatrol news. I’m pleased to say that Fans of WinPatrol has hit 1000 today. I will continue to promote Fans of WinPatrol to those already using Facebook but I have stopped promoting it on WinPatrol.com and other related websites. “As a security vendor there are too many dangers on Facebook to advocate its use”. Facebook isn’t by its nature a danger. The problem is anytime something is popular it becomes a target for the bad guys. Malware authors and privacy thieves have found fertile ground on Facebook for new tricks and methods to infect computers. It’s not uncommon for friends to have their password compromised and suddenly they become an unwitting accomplice in spreading malware. It can happen to very computer savvy users like Helen who quickly had to let her 2,866 friends know someone had her password. The most important lesson here is even if one of your friends sends you a link to something “cool” you should always be skeptical. If you think only your friends will have access to your profile information think again. This week it was revealed in a simple video how easy it is to steal personal info. I have a few topics to write about this weekend but due in part to an error in my normal blog program I’m a little behind. I use a nice little program called BlogJet by Dmitry Chestnykh to format and post to Bits from Bill. Since my latest install of Windows 7 RTM I haven’t been able to re-install and configure BlogJet. I thought it was a Win7 issue but after a little research I found it’s just a coincidence. Dmitry has always been responsive to problems in the past but he’s taken on a big challenge trying to keep up with changes on so many different blog platforms. Tonight, I loaded up my copy of “Windows Live Writer” which is available as a free download with Windows 7. This post isn’t meant to be a review of Windows Live Writer. It’s really a test to find out if I’m comfortable changing my Blog authoring tool. I’m an old fart and change doesn’t come easy for me. Live Writer has a number of available add-ons which I might help sell me. Here’s an example of the “Cool Emotion” add-on . This isn’t an add-on I will use because the images are hosted by someone else. The folks hosting these images now have access to user stats and I can’t guarantee these images won’t be compromised in some way in the future. This is another test to see what my Picture options are by showing you a screen shot of the Live Writer menu. I am impressed with the photo options. Various size and frames like the following Polaroid border style are available. It’s actually called “Instant Photo” frame because I’m sure they’d need trademark permission from the folks who currently own Polaroid. Yes, that is Lady the model for my Task Catcher program. Below is a “Map” add-on that will show you BillP Studios according to Bing. I don’t know if I’d ever really use this in a blog post but who knows. So, unless this all looks really stupid after I post it, I guess I’ll be using Windows Live Writer as my new Bits from Bill tool. Oh well, it looks like Blogjet may not be the only one having problems uploading to Blogger.com. Last summer I spoke at a conference of trainers for the National Network to End Domestic Violence. One of topics of interest was cell phone security. After reading so many news stories lately about cell phone hacking I thought it was important to renew this topic. Most of the tips still apply today. One important thing to remember is your cell phone or Blackberry is a computer. It stores your personal data and is designed to communicate easily with the world. Proper use includes keeping your data backed up regularly and keeping it secure. One of the common ways your cell phone or smart phone communicate is using technology called Bluetooth. Just like your computer, you should know about the following. This is a special mode that allows you to sync or pair up two devices that provide Bluetooth communications. In discovery mode information about your cell phone is readily available to Bluetooth scanners. In most new phones, when you turn on Discovery mode it will only be available for a short time frame. While this sometimes makes it a pain to pair up devices it’s a great safety feature. Your phone should never remain in Discovery Mode. Just like on your computer your password should not be 1234 or your birthday. It should not be your address, pets name or the same as your ATM pin. Don’t be shocked if you receive a request to connect for an update or what looks like a news story or free ringtone. It’s very possible this could be an illegitimate attempt at a pairing. If you do get an unsolicited request reply No. If it appears to come from your phone company, you can always call them directly to confirm. Again, just like on your computer, you should regularly connect to your phone vendor and see if any “firmware” updates are available. It’s possible that some kind of security hole was found in your phone’s software and a firmware update could be needed to repair it. When syncing up your address book or or other data with your computer check to see if encryption is available. This may require you to remember another password but it’s a good idea. While Bluetooth data is designed to only be available in short distances there are long range antenna’s out there which have the ability to read Bluetooth data from a distance. In part two I’ll review some of the most recent hacker techniques and what products are available that might be able to protect you. Are you a Firefox user? Apparently, if you are you’re not alone. Sometime this year when I wasn’t paying attention Firefox rocketed to a new high. For over three years I watched as Firefox hovered between a 30–34% browser share. This month I was surprised to see that Firefox consistently exceeds 40% and is preparing to take over IE as the most popular browser. A lot has changed in the past three years. In June 2008 the release of Firefox 3.0 was a huge event. Mozilla set the Guinness world record for the most downloads in a single day. Over 8 million users downloaded Firefox 3 on Junes 17th, 2008. While it increased the credibility of Firefox the browser world was still dominated by Microsoft’s Internet Explorer. The release of Firefox 3.5 didn’t break records but it was successful in attracting new users. Most folks are happy with the increased performance of Firefox but the availability of Firefox add-ons has really helped push this open source browser over the top. When I asked my friends on Twitter for their reason for the switch to Firefox, add-ons was a consistent reply. 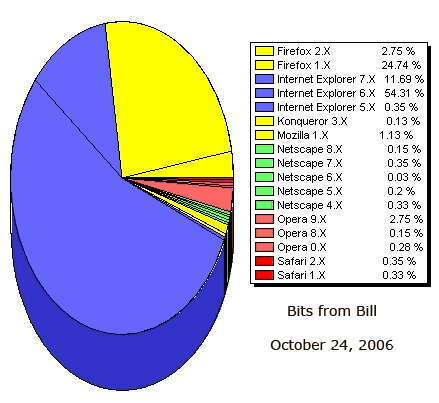 The stats above only reflect recent users to Bits From Bill. Some site will still show higher IE stats. 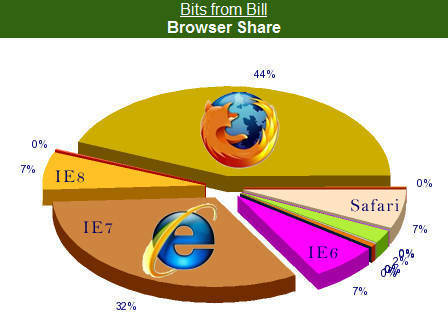 Currently, WinPatrol.com shows IE users as 48% and Firefox as 35%. According to Harry McCracken, Firefox is also popular on sites which have a large number of Mac users.